I found this read on Goodreads while perusing for a book to fulfill my reading challenge prompt of "a book involving time travel", which seemed somewhat of stretch for this category once i finished the book but, c'est la vie! "The world is ending...The message has come down from child to adult, child to adult, passed back down generations from a thousand years forward in time. The works is ending and we cannot prevent it. So now it's up to you." So upon his rebirth into his twelfth year, Harry tasks himself with finding out who is altering the worlds timeline, and plot a way to restore it to order. Can Harry out smart the aberration, or is the world doomed for destruction? Overall I enjoyed this read. I will say that it took me at least half of the book to really get into it though. The beginning did seem to drag, focused mainly on the many previous lives before the warning. And while it was interesing, it didn't really seem (at the time) to play into the larger plot line. Once things got rolling, it was entertaining to watch the game of wits transpire between Harry and our mystery villain (no spoilers!). 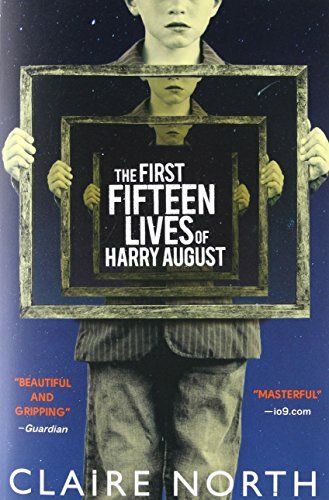 The concept was neat, and I enjoyed Harry and reading about all of his previous lives. Made me wonder what I would do with an endless amount of time at my disposal. Would I learn new languages and earn various degrees with each new life, or play the lottery and live each life as one of leisure? (I'm still undecided at the moment, probably a little both seeing as I have all the time in the world!) Interesting and fun, if a tad slow, but one that I would recommend none the less.